The weather here in Florida has been awesome this winter. Because it has been so warm I find that I have to share my stamping time with yard work. 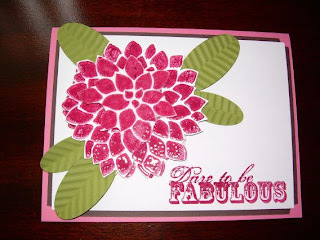 I love a pretty yard and garden so it is no wonder that I enjoy the many flower sets in the Stampin'Up catalog. The Fabulous Flowers set is no exception shown on page 84. Speaking of the catalog you can access it on my BLOG by clicking to the upper right of this page. Sale A Bration continues for another couple of weeks. Don't miss an opportunity to add additional stamp sets or rub-ons to your supplies for FREE. Don't miss this once a year opportunity to get a stamp set for free with every $50.00 in merchandise purchase.